Thursday night: I prepared me sausage sarnies with BBQ sauce, I tried reading me book, but no sleep came. Put on a DVD, but no sleep came. Eventually I drifted off… and the dreams came again, no idea what they were about, but these nightmares were not the only thing that kept waking me up. Each time I presumably moved in my sleep, the ‘Inch’ was rampant and oh so painful. Still, no bleeding from it last night, just pain. Took rubbish out to bin. My body told me it still wanted to sleep. But after having to get up and check things out medically, I could not nod off despite the weariness. So, I got up, put the water heater on, started the laptop, made a cuppa, and took me medications. Seemed quiet this morning (Fair enough, I’d not got me hearing aids in), and I had a feeling of dread or fear? Mingled with an expectancy in the air of disaster perhaps? Weird feelings abound. I started to do/touch up some graphics and posts for me blogs. Got missen looking and smelling pretty, then set off to walk to Sherwood to donate me bit and pieces. Got as far as the end of the road: I returned to the hovel to put me hearing aids in, and set off again. Managing to forget to call at the GP once again! Huh! Got to the Nottingham Hospice Charity Shop, and dropped off me bag. Asked about the donor card, and they found the one I’d filled in. They gave me a card to lose later. Said me cheerios and went to catch bus into town. On which I got through some more of me Eric Morecombe book, and nibbled some seaweed. Not many people about for a Friday? In town, I poddled through the centre, on me way to C&A to see if they had any cushion/pillow of the size I wanted, but no. 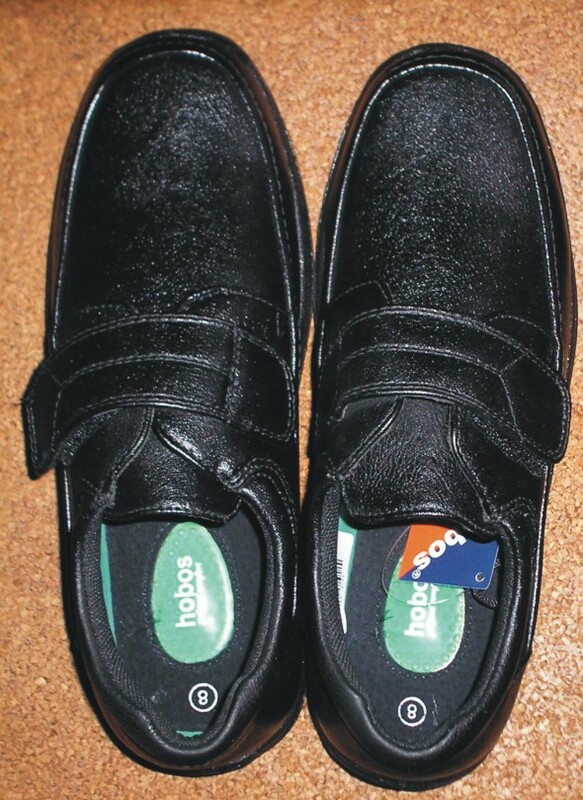 I looked at their comfortably fitting shoes, but declined due to the £49 price tag. So I tried the shoe Zone cheapo shop, and got a pair for £9.99. Then tried another shop to see if I could obtain a pillow/cushion of the size I required. After mushc searching I gave up, came down to the ground floor to exit the premises – and saw one on display on a settee. I had a look at it, and it had a £26 price tag on it! But still, it looked just what I was after, so I treated missen to it. I then made me to the 99p shop. 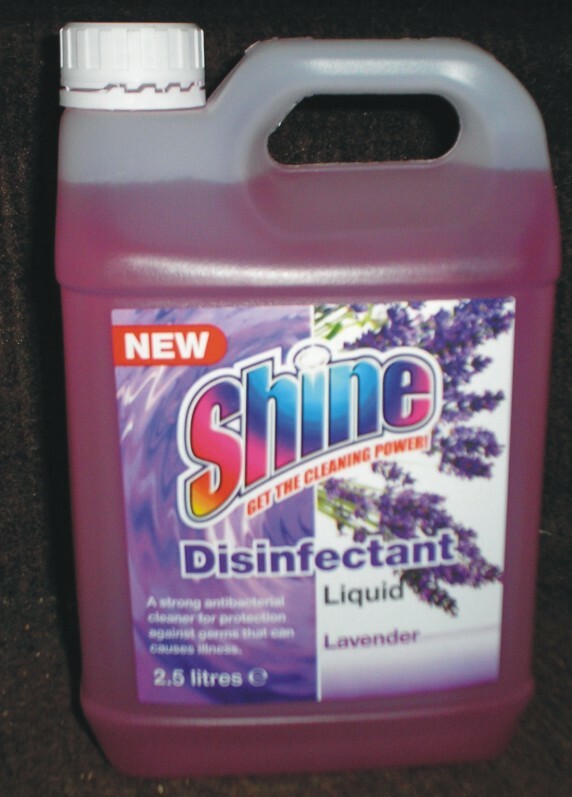 And bought some lavender disinfectant for only 99p for 2.5 litres. On me limp around the shop moseying, I saw some bread mix with balsamic vinegar. I thought me sister Jane might like that, so I rang her. While we were talking, I glanced outside the shop, and saw a lady take a tumble, so I stopped the call and went to see if she was alright. She was as it happens, so I walked her to her bus stop. She sounded fully compos mentis. Rang Jane back, she didn’t want the bread mix though. The bags were getting heavy again now, the knees and feet twinging too. 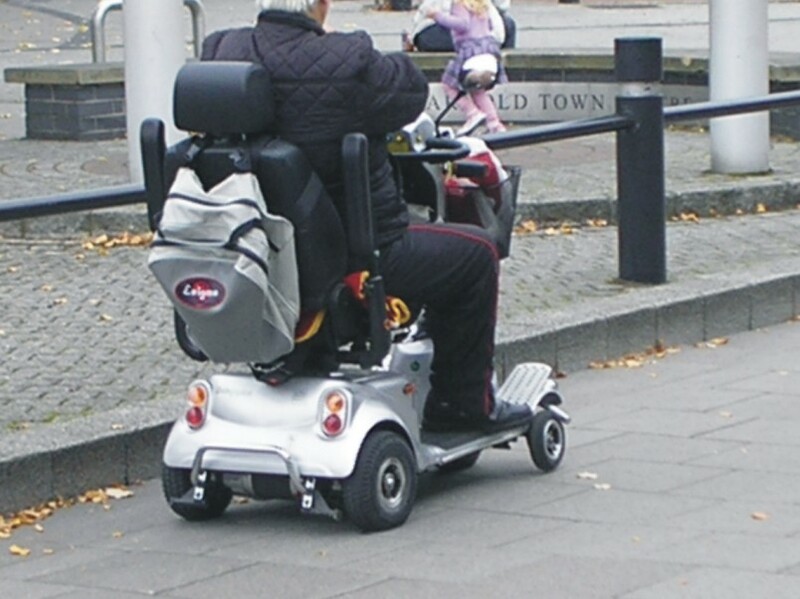 As I left the centre, a mobility scooter threatened, but veered off at the last moment – why am I plagued by these? I went straight passed the GP surgery again, and got home, weary and annoyed with missen for spending so much. Penned by our Nottingham WordPress resident the decrepit impecunious pensioner, of great senility and ill health Mr Juan Inchcock, with the hopes of encouraging.. er… well something! On my last walk around Nottingham City’s abandoned shops… I mean City Centre, I came across some council workers removing a sign from the wall. Created by Joseph Else, the 2 stone art-deco lions stand guard on either side of the entrance steps. They are similar in design to the lions used to publicise the British Empire Exhibition at Wembley in 1924-25. There are alternative ‘names’ attached to them, some people call them “Menelaus and Agamemnon”, others “Leo and Oscar”. Whatever their names, arranging to meet ‘At The Lions’ has become an essential part of Nottinghamian life since the building opened. Where the higher class ‘Totties’ would gather, hoping to ply their trade with the more affluent visitors to the ‘Black Boy’ hotel (Now criminally destroyed by backhander seeking councillors) just along the road. I’m told the Totties provided £3 and £5 servicing. 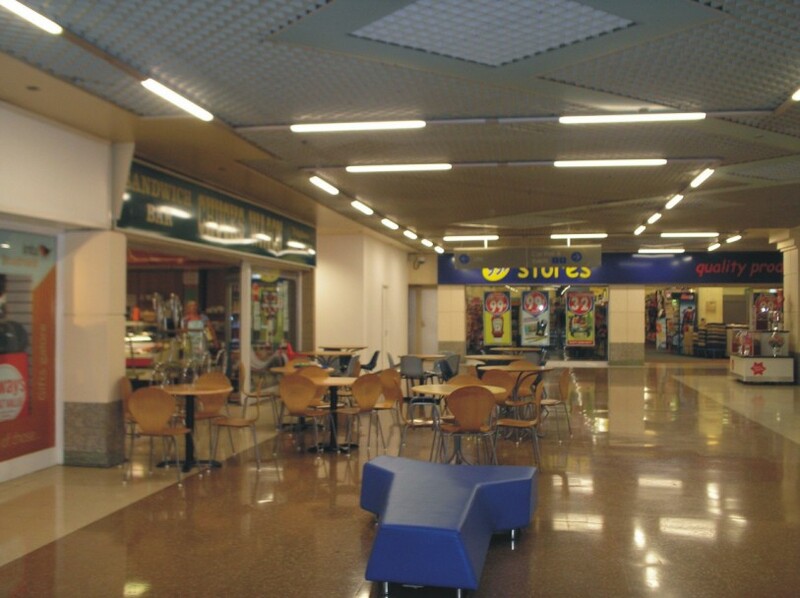 A popular meeting point for the shoplifting squads and locals. The regular appearances of Protest meetings, Big Issue sellers, a Parking Attendants favourite point of observational value and during the regular various foreign markets, an absolute haven for pickpockets. The Right side Lion – The more popular of the Lions as a meeting-up place. 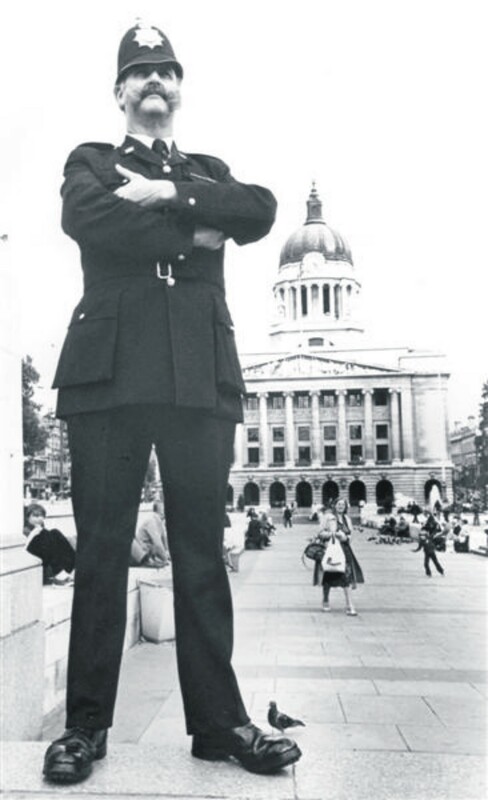 Where local PC’s Dennis ‘Tug’ Wilson (7′ 2½ inches) and Geoffrey Baker (6′ 8½ inches) would position themselves to keep a keen eye on the populous of the City, and responding to questions from the public, and always alert. The graffiti is cleaned off regularly nowadays. The CPO’s (Community Police Officers), and occasionally a real PC can be seen using their mobile phones, and if they are needed, as soon as they end their phone call, citizens can speak to them. Nearby you will find the Big Issue sellers, street artists, beggars, Motorbility scooters, Skateboaders, Cyclists and other dangers. No Special Foreign Market’s were held then. But there was a speakers corner. 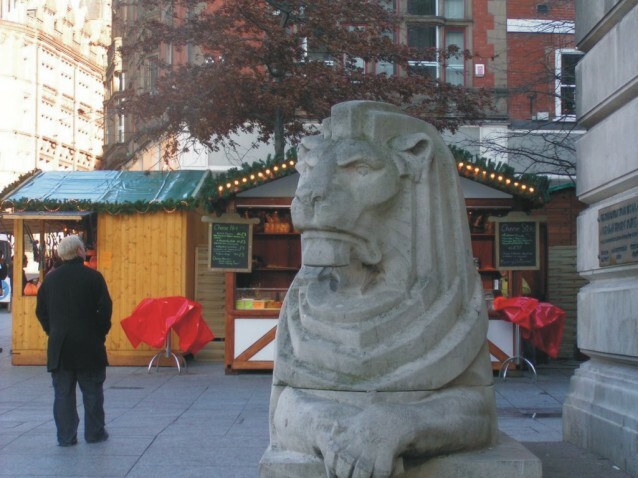 Themed markets are a regular appearance in the slab square nowadays. Themes including: Lithuanian Foods, German, Polish, Austrian, Australian Foods, French Products, and Asian Foods. Amongst the items you would not have been offered in 1963 are: Kangaroo burgers, Shark steaks and Blueberry candyfloss. The Sacheverell riots of 1710, riots were a series of public disorder outbreaks that spread across England during the spring, summer and autumn of 1710 in which supporters of the Tories attacked property and places of worship of Whigs St Mary’s Church just off the Slab square becoming a victim. 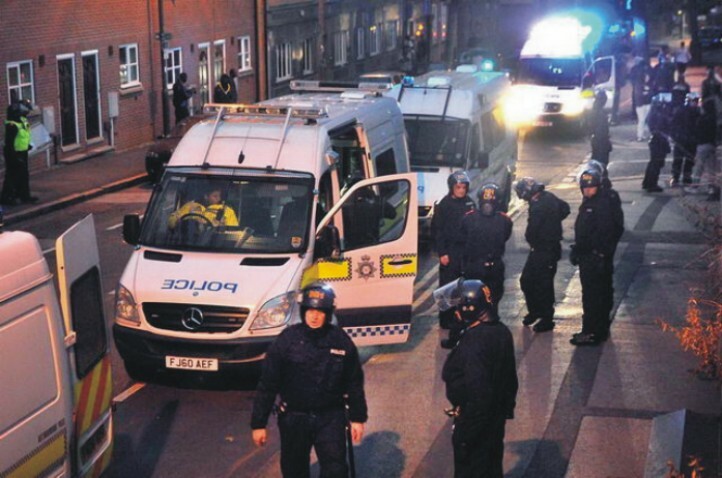 The Spitalfield Riots of 1769, Luddite Riots of 1812, Reform Bill riots of 1831, Racial Riots of 1958, Protest Riots of 1981, and the Protest Riots of 2014 all had occasion to ply their violence, along with other locations, on the Nottingham Slab Square. The muggings continue, but most of them have moved to the suburbs where there are fewer CCTV cameras. I recall a few skirmishes between Mods and Rockers, and between football fans occasionally. Last year there were 485 shoplifters arrested (Although less than 200 were prosecuted) – 211 arrests for using threatening behaviour or using violence – One murder – Nine stabbings – 156 assaults – 18 nights of rioting activity – 3 police vehicles fire-bombed and attacked – 4 police officers hospitalised – 9 Ram raids – 11 shop raids with violence – 2 street dwellers died. 8 people knocked over by drunken or illegal drivers – 4 Taxi drivers robbed and assaulted, and 126 muggings. 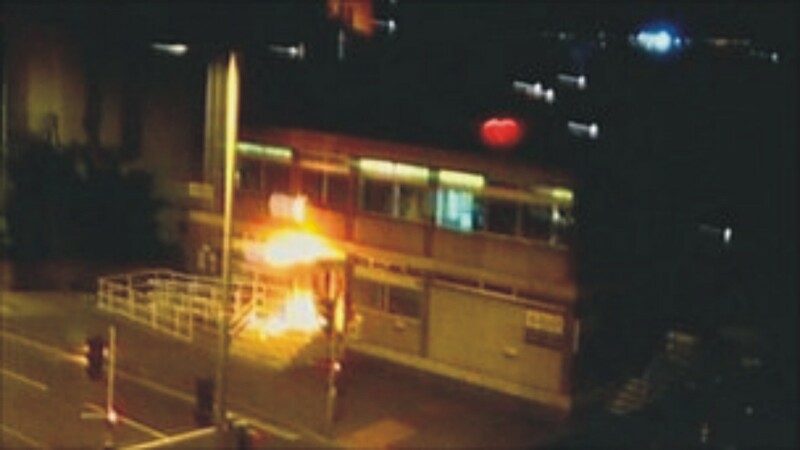 Oh, and the nearest police station was fire bombed. Black Taxi’s with white bonnets and boots lined up on the right side of the Slab Square. Fairs from 1/3p (5 ¼d) Some of the drivers could speak English too. Custom designed and built London style Taxi’s are now ranked off the Square. Fares from… well I don’t know, I can’t afford to use them nowadays. The new Trams and Motor-buses without conductors rule now. Tickets from £1.80. There were about 65 businesses around the square. Lyons Cafe being another popular meeting place for Nottingham residents. There are still about 65 businesses around the square, but a third of them are closed down. There are now far more eateries, less banks, and the excessive proliferation of Pawn Shops, Charity Shops and Pay-Day Loan sharks were not around in 1963. The new fountains are a popular place for children to play in and swear at passers by. Unemployed benefit seekers, immigrants, shoplifters, muggers, and wino’s to meet. In the event of anyone being tempted to move to Nottingham for its Multiculturalism, Wealth, Serenity, or Placid lifestyle, as a result of these meanderings – Please read between the lines!